Last year I posted a song a day in December, something that had impacted me in 2016, or something that has held special through the years, something to lift up or narrate as we were launched into a new era of heightened tension, unrest, and activism with the Trump election. And so as we step into the first day of December, I'd like to embark on December Songs, 2017. While I'll try to find compelling videos to go with the songs, it's not always possible. It's really about the song itself or the artist behind it. 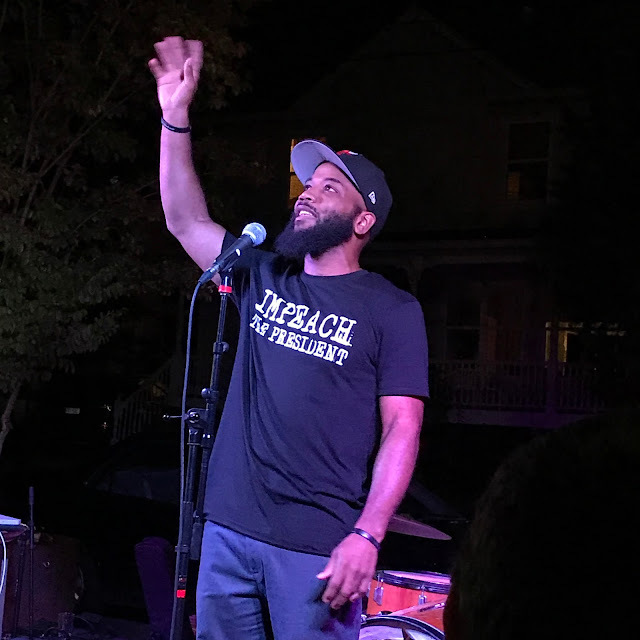 I'd like to start with A.D. Carson, a rap artist I learned about after the events of A12 when I saw him perform at a recovery event at The Bridge PAI. A.D. is a professor of hip hop at UVA. This song is the first on his album, Sleepwalking Volume 1. It incorporates a poem he read at McGuffey Park on the morning of August 12 and it seems just the right piece to begin my month of musical posts. I missed A.D.'s performance at McGuffey, I was already in Justice Park I believe. But this day has defined so much for so many of us, as we continue to struggle with its impact, its continued threat, and the wake up call to fight for social justice. And an interview with him reflecting on the event and the times and Charlottesville. I wrote this little poem the night I saw A.D. and some other excellent musicians and poets perform at The Bridge. It was an inspiring night. Thanks A.D. for your great work. Welcome to Charlottesville.